When I was a kid my parents would keep every piece of artwork I created. It first lived on the fridge for a little while and then migrated it’s way to a large storage box in my room. By the time I moved out of home at 21, there were thousands of paintings, drawings, crafts and other creative knick-knacks I made during my childhood. Unfortunately, I rarely looked over these cute and memorable art pieces because they were difficult to access, and simply took up too much storage room. I ended up having to throw them out when I moved out, which was a real shame. Now that I have my own kids, I love to treasure their artwork and creative endeavours by taking photos with my smartphone. If you’re a parent, I’m sure you’ve done the same. The only problem is these photos end up getting mixed up with everything else on your phone and there’s little organisation so they just collect digital dust. As we have travelled around the world we have to keep what we carry to a minimum so the lifespan of Mia and Caius’ artwork is even shorter. This is when I came across Keepy. The idea of recording, organising and sharing my kids artwork, accomplishments and special moments with a close group of friends and family sounded perfect. So I put it to the test. Keepy was originally released for iOS in Australia in June 2013 and the rest of the world 3 months later. The Android version came out in December, which is when I put it through the wringer on my Galaxy S4. Record audio with each photo, preferably from the child to make the treasured memories more vivid. Record video comments from proud parents, grandparents, etc. so your child can be encouraged. Nifty integration with Zazzle so you can turn any photo or artwork into a gift such as a mug, stickers, keychain, t-shirt and more. 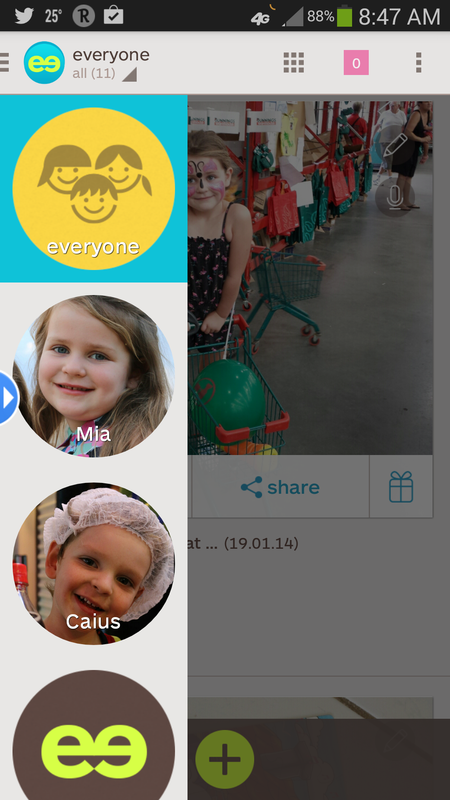 Your family and friends can download Keepy and register as “fans” for your kids so they can see what cool things your kids are up to, and share their encouragement. If you’re worried that grandpa or grandma will be left out because they refuse to get on the smartphone bandwagon, then it’s good to know keepies can be published to your private, secure Keepy mini website. What about when you have 2 parents taking snaps on different phones? Never fear, just add “mom” or “dad” as a “fan” as well, and they can add keepies to your child’s account. Smart! I particularly like the ability to tag photos so they are categorised for easy retrieval later. For example, I can choose to see all the artwork Mia did. Since your photos, audio and video clips are stored in the cloud your data is safe even if you lose your smartphone (or it gets dropped in a bucket of water, as has happened to Erin’s phone before). But if you don’t feel 100% comfortable putting your valuable photos in the hands of Keepy’s servers, never fear, there is free integration with Dropbox so a copy of all photos are stored there as a backup. 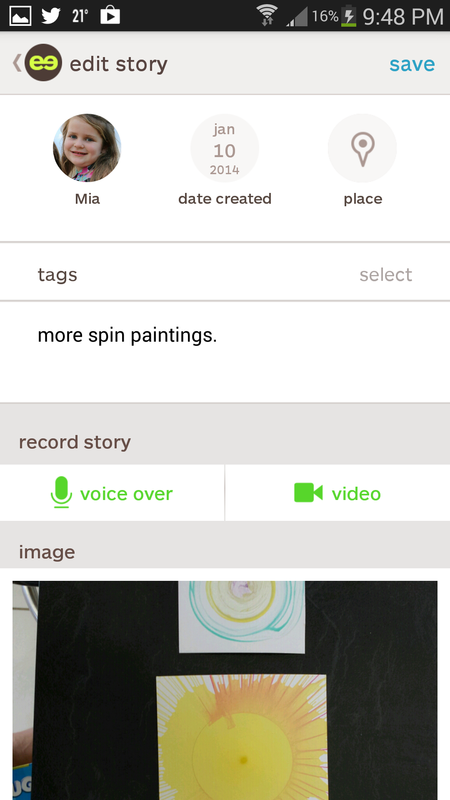 How you use Keepy is only limited by your imagination – record your child’s arts and crafts, family holidays, special events, birthdays, school events and more. And you’re not limited to photos. Keepy will also allow storage of notes so you can remember those funny things you child says. With a free account providing up to 31 keepies (photos) per month that may be more than enough for what you need. But if you’re an avid collector of your child’s cute escapades, then there are higher packages available which are still very affordable at $1.99/mo for 101 keepies/mo and $2.99/mo for unlimited keepies. For such a young app, Keepy has achieved a remarkable simplicity and intuitiveness as they have reinvented the family photo album. Now, the Bender family can all enjoy and share treasured family moments anywhere we are around the world. 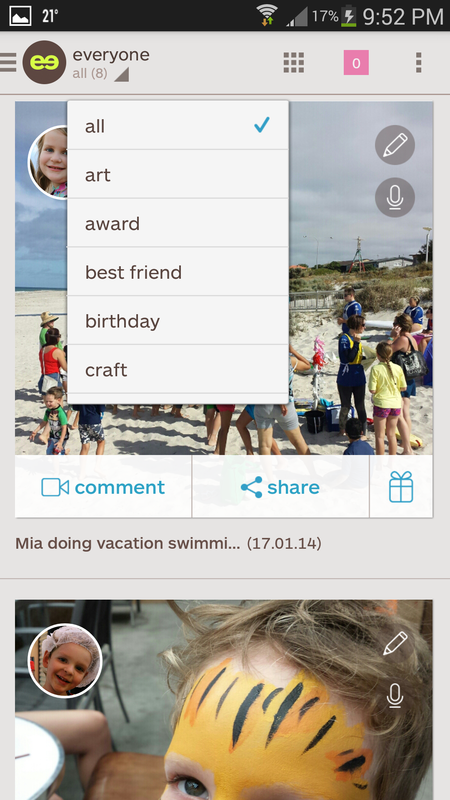 Upload photos and notes to preserve your child's achievements and special occasions. Integration with Zazzle so you can create physical products from your child's artwork.